The Lockheed P2V Neptune was the first aircraft created from the ground up specifically for the ASW role (Anti Submarine Warfare). It was designed during World War II but never saw action in that war. 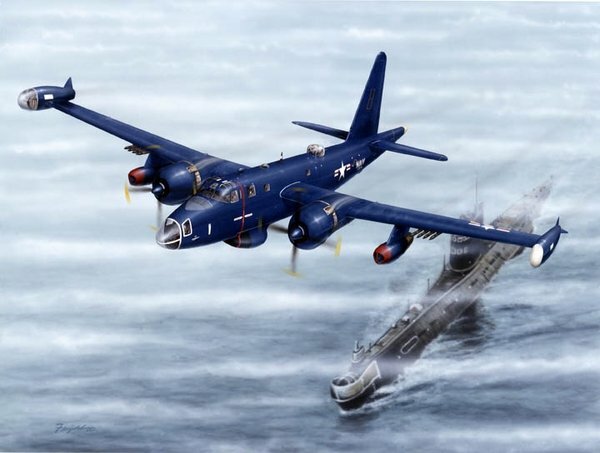 The rocket equipped P2V depicted in this image experiences one of the biggest thrills any P2 crew could have - spotting and tracking a Soviet sub. In this case it is a fog-shrouded 'Foxtrot' class submarine in calm seas sometime during the 1950s or 60s.